This post was written by Hatchet editors Victoria Sheridan and Ryan Lasker. 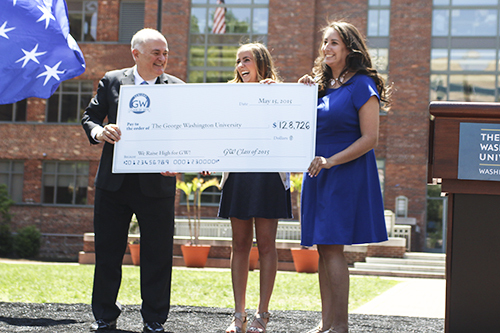 About 60 percent of seniors participated in the Senior Class Gift campaign this year, raising a record-breaking $128,000. With 60.3 percent of seniors donating, the campaign marks the largest-ever donation total and highest-ever participation rate. The donation total is nearly 50 percent higher than last year. The campaign, which pushes seniors to make a gift before graduating, has seen participation rates rise about 17 percent since 2011. The campaign’s coordinators said late last month that the campaign had received gifts from 40 percent of seniors, meaning about 20 percent of seniors have donated in the past month. “Every year [University officials] set a goal that they think they can attain but just the fact that we’re here today, it’s beyond words,” Ryngel said. 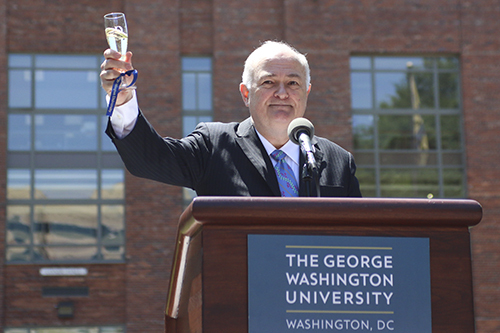 Before leading the toast, University President Steven Knapp took the stage to talk about how graduating seniors’ donations could “make history” at GW. Knapp was joined at the event in University Yard by Board of Trustees chair Nelson Carbonell and Aristide Collins, the vice president for development and alumni relations. Carbonell has historically made a matching gift to the campaign, though he did not this year. Carbonell has donated more than $156,000 to the University’s financial aid fund as part of the Senior Class Gift challenge since 2010. Donations to the Senior Class Gift campaign count also toward the University’s $1 billion goal – part of a comprehensive fundraising blitz that launched last June. Officials had raised about $700 million as of February. Dean of Student Affairs Peter Konwerski said that philanthropy helps cut the costs of attending GW for future generations of students. Each year officials set a higher participation total to encourage more and more students to make contributions and get in the habit of giving back before they graduate. The campaign’s coordinators host happy hours and events throughout the school year to encourage seniors to make gifts. For a week last month, an anonymous alumna matched campaign donations of up to $3,000. Tim Miller, the director of the Center for Student Engagement, said the University’s goal to get students donating early gives the students the opportunity to “see the benefit” of their contribution. In between sips of champagne from complimentary champagne flutes, seniors were asked to write thank you notes to people who impacted them during their time at GW, like student organization presidents or resident advisers. Seniors are allowed to donate to a specific area of the University, like financial aid or their student organization. Alix Cohen, the other Senior Class Gift coordinator, said she enjoyed hearing the reasons behind each senior’s donation. Nicole Alainko, an international affairs major who donated $25 to the Women’s Leadership Program, said that designating money to specific organizations or programs allows seniors to “show what’s important” to students. “Whatever they’ve given to us, it’s our job to give that back in a way and give future students those opportunities, especially given budget cuts,” she said.